Where have all the Enterprise Architects gone? The role of enterprise architect no longer holds the weight it once did. Gates, Jobs, Zuckerberg: all were deeply business-minded technologists, but whose legacy rested on their ability to be Enterprise Architects of the behemoths they created. As business strategies increasingly depend on rapid technology change, most CEOs delegate this skill. But to whom? This year’s Harvey Nash/KPMG CIO survey shows that IT leaders are seeking to build enterprise-wide digital strategies to produce nimble and responsive technology platforms. But the survey also demonstrates that organisations are struggling to find the very people they need to help them do this: Enterprise Architects (EAs). The solution, KPMG argues, is to reimagine the role of the enterprise architect. Many in IT will admit that over the last five years or so, EAs have become rather out of fashion. The industry standard ‘TOGAF’ certification has become seen as undifferentiated, describing the best practice structure for a type of IT which is diminishing in importance relative to nimbler, disruptive plays. Before the combined power of cloud, analytics, mobile, IoT, social and cyber created a faster pace of technology change than ever before, IT operated within a stable paradigm. Most IT delivery had a large critical mass, and relied upon multi-month and multi-year projects with thousands of person days. EAs had to deliberate at length and police standards because the implications of their decisions were costly: in this model, if IT failed, it did so slowly, and at great cost. Now the mantra is “fail fast” – so risk-avoiding EAs look like an analogue solution in a digital era. Those who thrive look very differently at risk: they are prepared to relinquish control to ‘as a service’ offerings, they translate business opportunities into digital products rather than business requirements into applications, and they are prepared to fix and improve products iteratively instead of having to get it right first time. The result has been that the pipeline of enterprise architects is running dry: the industry cannot find digitally-talented EAs. As a result, EAs have shot up the skills shortage list in this year’s survey, growing by 26%. This is a problem, because EAs link up business and technology strategy. In the short term, businesses who discard EAs may feel they are removing a millstone: a costly function which often constrained delivery programmes by highlighting risk. As advisers to CIOs, KPMG often hears criticism of “negative” EAs, operating with a checklist mentality. This criticism is fair, but the solution is not to remove EAs – and the CIO Survey indicates CIOs recognise this. To succeed in the digital world, organisations need to simplify, automate and consolidate their estate. EAs are absolutely critical to this: you can’t have a successful enterprise-wide digital strategy without them. It is possible to fly seat-of-the-pants digital projects in isolation, but that cannot be your default mode of corporate technology delivery. Similarly, as functionally rich solutions are superseded by decomposition into services, integrated via service fabrics and APIs ‘managed as products’, Enterprise Architecture grows in importance as the vantage point from which APIs, micro-services and service orchestration can be governed and planned. These gaps cannot easily be patched up. Architecture is a way of thinking and doing –a mindset as well as a capability, and a discipline of technology engineering. In part this is why EAs have been slow to adapt to the digital era. But as fewer onshore technologists undertake coding roles, there is now a smaller pool of people who have both complex engineering and close business exposure. Once again this year, around 60% of respondents report skills shortages. In the past twelve years, there have been only three occasions where less than half of IT leaders reported skills shortages, suggesting that finding appropriately skilled talent has become a perennial concern in the sector. By region, Asia Pacific has the highest proportion of respondents reporting skills shortages (68%). In Europe, the figure is 63%. North America has the lowest proportion – 56% down from 64% in 2016. By skillset, enterprise architecture is the fastest-growing skills shortage, up a massive 26% compared with last year. A third (34%) of respondents report shortages in this area. Big data/analytics remains the most in-demand skill, however, cited by 42% of respondents, an increase of 8% in the past twelve months. The third highest shortage is for business analysis skills. In one client, who was lagging behind peers in bringing products to market owing to their delivery cycle times, an Enterprise Architecture transformation made them national market leaders in their sector (by market share). They restructured their budgeting cycles to make more decisions on a quarterly and monthly basis, rather than annual. A layer of EA management was eliminated. Domain architects were empowered to approve far more experimental products. At another client, EAs were told that some technology failures in an experimental (but still live and customer-facing) class of product was not only tolerable, but expected. There was a galvanising effect on delivery times – and failure rates did not increase. 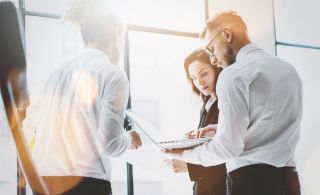 KPMG’s view is that this approach to Enterprise Architecture is as important to digital success as DevOps, nimble delivery methods and orchestration - all dimensions of what we call “Continuous IT”. As organisations pivot towards digital delivery methods, the best will reimagine Enterprise Architecture. In this way, digital will benefit from the gains in business intimacy, strategic insight and technology reliability which EAs have wrought on all technology delivery models since IT became an indispensable part of business success. Disruption will happen, but talented EAs are still needed – through digital and beyond.